So you want to create a blog/ website. You made the necessary arrangements and made your blog/website online. But simply getting it up and running is not enough. There must be provisions on your site for visitors to be able to contact you. Forms give your readers an easy way to contact you. There are different types of forms that you can embed in your site – contact form, search form, registration form, order form, user login form, file upload form write for us form and so on. 1 Why Use a Contact Form? If you have just stepped into the vast cyber world of blogs and websites, you might be faced with a certain dilemma as to why use a contact form, when you can simply add your email-id on your site for your visitors to contact you. Many step back from adding forms on their site, due to fear of requiring coding knowledge to implement it. Even though the fact is there is no such requirement, and adding a form is as simple as a few mouse clicks. Fast Communication – Contact forms are a great way to allow your readers to quickly contact you. Consistent Information – While using email is still a great way of establishing communication, visitors may not always send you all the information you need via email. With a contact form, you can explicitly specify what information you require from your visitors like their phone number, budget, or anything else. Contact forms help you stay organized, by providing the same information in the same way. Multifunctional – A contact form can be used for multiple purposes. It is highly ideal for almost any sort of two-way communication. Various tasks, including visitor’s feedback, client’s query, customer support, or engaging in a corporate communication can be easily done using a contact form. Decrease Bounce Rate – Bounce rate refers to the number of people who visits your site, browses and drifts away. Use of email takes your visitors to their email tool or any other page too early. But with a contact form you can ensure that your visitors remain on your site or you can specify the particular page to which they should be directed after filling the form. Maintains the standard of your site – Use of contact forms is so common nowadays that the absence of one might make your site appear broken to some visitors. Having a contact form maintains the quality of your site/blog and does not disappoint your visitors. By now, you must be clear as to the importance of using contact forms on your site/blog. While there are tons of contact form plugins available for WordPress such as Contact Form 7, Ninja Forms, Fast Secure Contact Form, WPForms is one the highest rated and the most beginner’s friendly WordPress contact form plugin. WPForms is a drag and drops WordPress form builder, designed to provide the best user experience. It enables you to create various forms of contact form, email subscription form, payment form, and other types of online forms within minutes and without writing a single line of code. It allows easy customization and positioning of the fields in your form. WPForms is perfect for business owners, bloggers, designers, photographers and basically for everyone else. With over 700,000+ installs and 1500+ 5-star ratings, WPForms has already established itself as one of the favorites of the WordPress community. WPForms Lite is the free version, which is used for building simple Contact forms. It also comes with a Pro version which of course offers more benefits by providing some powerful features such as multi-page forms, payment integrations, conditional login and many others. 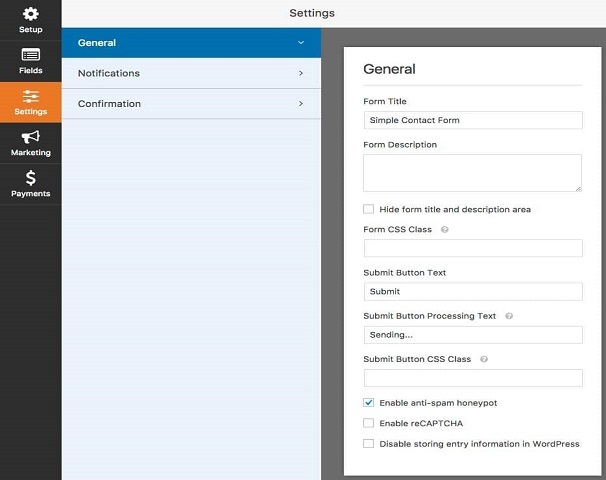 Drag and Drop Feature – Creating a form using WPForms involves a series of drag and drops. 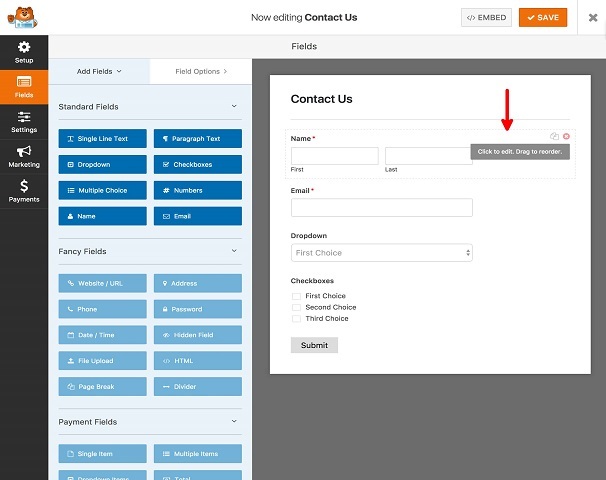 It’s designed to match your workflow and allow you to create custom contact forms in minutes. Easily add custom form fields and arrange them, by simply dragging them and placing at the needed spot. No knowledge of coding is required. Pre-built Form Templates – If you are at the beginner’s level, building a contact form from scratch might be a bit intimidating as well as time-consuming. 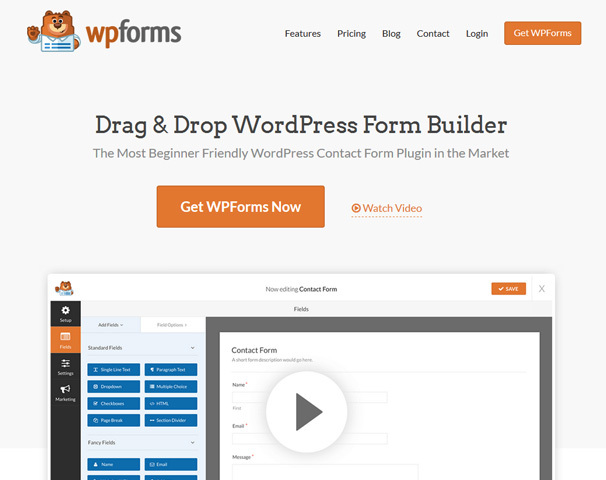 WPForms comes loaded with a set of pre-built templates, unlike most other plugins of the same category. You can add, remove or re-arrange fields as necessary. 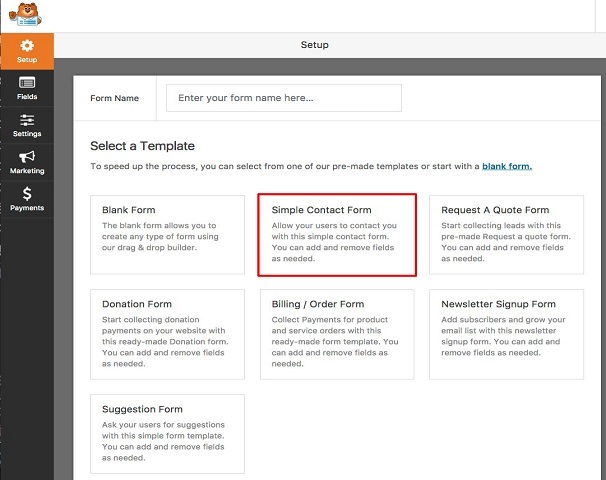 Whether it’s a simple contact form, donation form, payment order form or a subscription form, WPForms has templates for almost all of them, in its Contact form builder. 100% Responsive – WPForms are 100% responsive and mobile friendly. It automatically adjusts itself to fit smaller screens for better visibility. SEO Friendly – It is one of the most SEO friendly plugins available in the market. Optimized for Speed – The faster, the better. This is what WPForms claims to achieve. The plugin has been developed with optimized queries on the front-end as well as the back-end to ensure maximum speed. Forms can be embedded on any page with optimized title and description. It is one of the fastest WordPress Contact Form plugins. Instant Form Notification – It features an Instant form notification system that enables to quickly respond to incoming inquiries. File Upload Facility – This feature allows you to collect files and media through your contact form. Multi-page Forms – Some forms are quite long, which makes the users scroll up and down the form, which sums up to a bad user experience. WPForms has this multi-page form feature which splits long forms into multiple pages to improve user experience. Easy Integration – WPForms allows easy integration of your contact forms, with an email-marketing service or collects payments for bookings and orders. Easy to Customize and Extend – With WPForms, customizing your contact forms is easy, thanks to its section dividers, HTML blocks, and custom CSS. It also comes loaded with tons of hooks and filters, to further extend the functionality of the plugin. Custom Captchas – You will also be able to provide custom captchas on your contact forms. 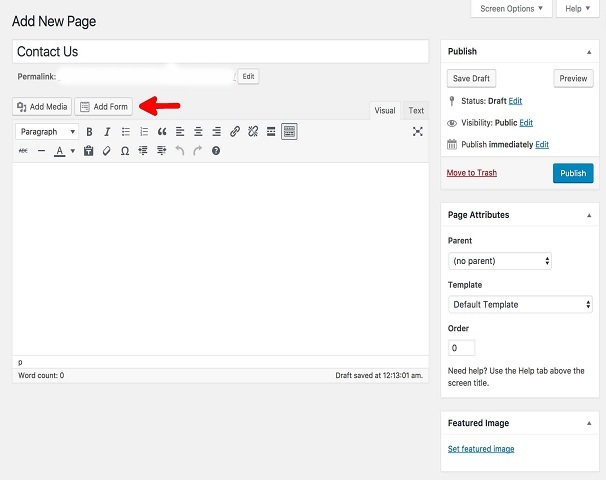 Login to your WordPress admin area and then navigate to Plugins -> Add New. Settings – This is the main Settings menu, where you can customize forms, including form styling, configure anti-spam tool, form validation messages, general settings, email configuration, constant contact integration and much more. 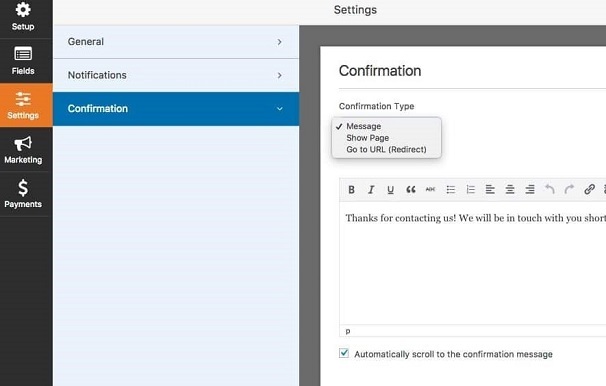 Add-ons (Pro Version) – WPForms can be integrated with many add-ons including AWeber integration, Campaign Monitor integration, Conditional Form Logic addon, PayPal add-on and many others. These add-ons drastically enhance the functionality of WPForms plugin. Now if you click on WPForms -> Add New you will then be taken to the WPForms “Form Creation” section. 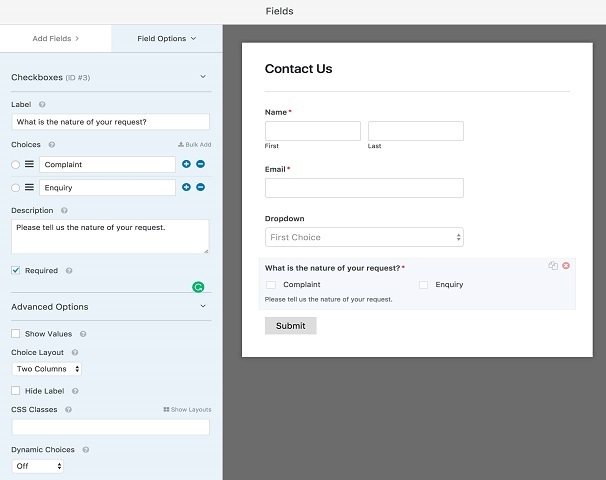 Fields –You can add and remove various form fields from here. Settings – Set various settings associated with your form including “Submit” button text, CSS styles, form confirmation notice and many more. Payments –If you want to integrate your form with various payment providers like Stripe and PayPal, this is where you would do it. On the right-hand side, you will find a textbox where you can provide a name for your form. After that, you can select the template that best suits your form or creates a blank form from scratch. It contains the following templates – Blank Form, Simple Contact Form, Newsletter Sign up Form, Request a Quote Form, Donation Form, Billing Order Form and Suggestion Form. Here we will take a look at how to create a form from scratch as well as creating a form using templates. 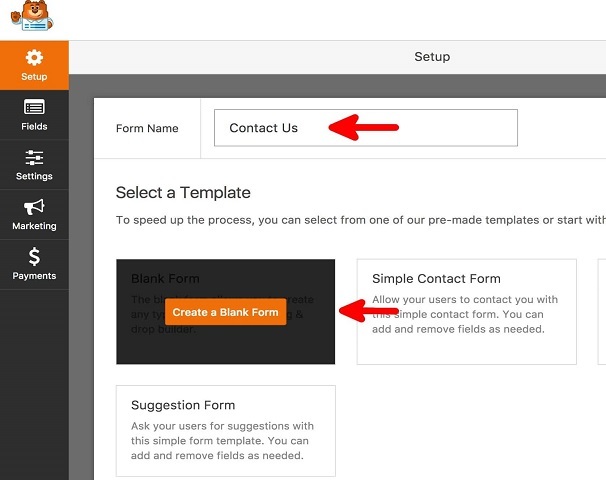 To create a form from scratch, give a name to your form, say “Contact Us” and select the “Create a Blank Form” template. Next, you will be taken to the Fields tab, from where you can drag and drop fields onto your form. Several fields are available including Single Line Text Fields, Paragraph text, Multiple choice fields, email fields and many others which are grouped under Standard Fields, Fancy Fields and Payment Fields. Most of the fields are self-explanatory. 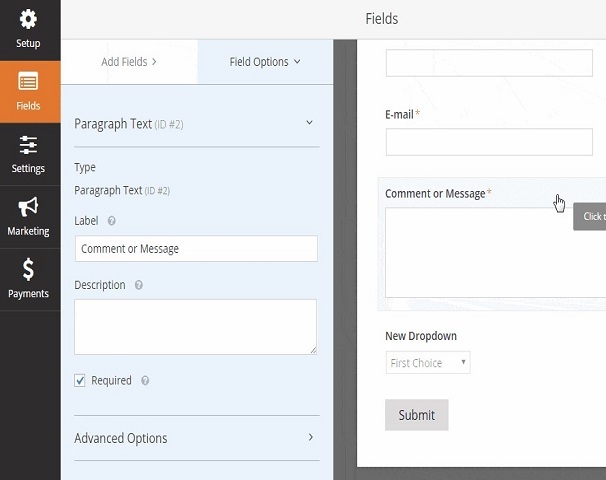 Let us drag and drop a few fields such as Name, Email, Dropdown and Checkbox field on our form.Hovering your mouse over the fields displays a message “Click to edit. Drag to reorder “. It means that the fields can be dragged and repositioned anywhere within the form. Now to edit a field, hover over it and click it, to go to the field options screen. Alternatively, you can also click on the Field Options tab on the upper top left of the screen (next to the Add Fields tab). Let’s edit the checkbox field. Here you can find a list of options related to checkbox editing. Dynamic Choices – This option is used to auto-populate the checkbox options from other data in your WordPress installation including your site’s taxonomy and page title data. And that’s it we are done creating our form. A new window will be presented to you. Fill in the respective fields with your first and last name, your email id and any comments/message. This fields can be dragged around and repositioned within the form. Clicking on any of the fields reveals the field option associated with it. In the left-hand side, you will also be presented with various fields. To use any of the fields simply click and drag it to your form. Click on the Submit button once you are done. For every form you create, there are some settings available which are categorized into General, Notification and Confirmation settings. Let us first check out the General Settings. Submit Button Processing text – Here you can provide the text that will appear during the form submission process. Submit Button CSS Class – Change the appearance of the submit button by providing a CSS class here. Anti-spam Honeypot–Enable/disable the Anti-spam honeypot option to reduce the spam you receive. Finally, there are options to enable/disable reCAPTCHA and storing entry information in WordPress. Form Notification is the email you get after someone submits the contact form on your site. 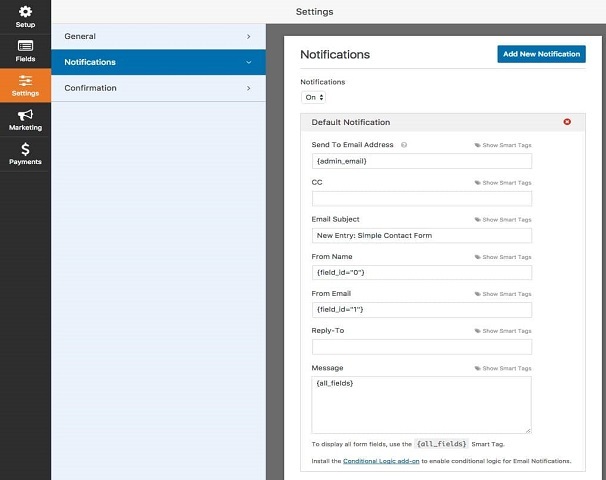 Notifications are by default send to the Admin Email that you have provided on your site. However, if you want to provide a custom email address then you can change it over here. Message –The body of the email message is provided here. Confirmation Type – here you have 3 options to choose from – Message, Show Page, Go to URL(Redirec). Show Page – Redirect your users to some custom page on your site, such as a Thank You page. URL –This will redirect users to another URL on your site or some other site. Now that you are done with creating your form, it’s time to add the contact form on your site. This shortcode can be inserted on any page/post to add your custom form. After you are with the above-mentioned steps, your custom contact form will be added to your site. 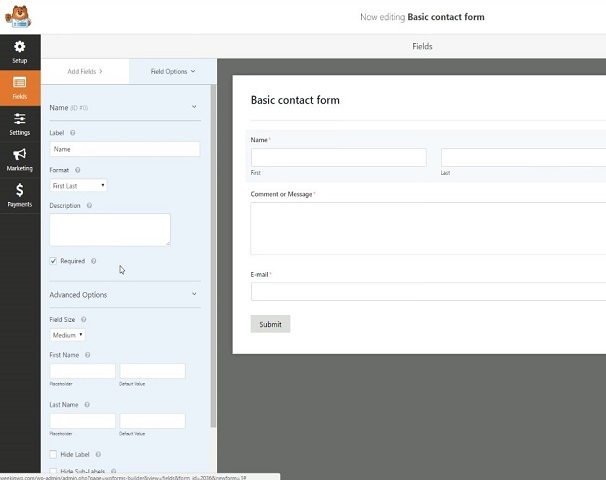 With WPForms, not only are we able to create beautiful forms, we can also manage them. 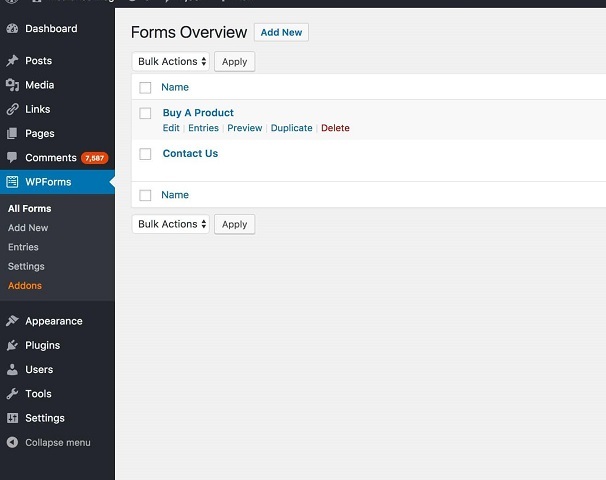 Simply navigate to WPForms -> All Forms to see all your created forms. From here you can edit an existing form, add Entries to forms. Preview your forms, duplicate and delete your forms and so on. As you can see it is not difficult to imagine why WPForms is considered to be one of the best WordPress Contact Form Plugins in the market. If you want to add a standard contact form, WPForms is highly recommended. 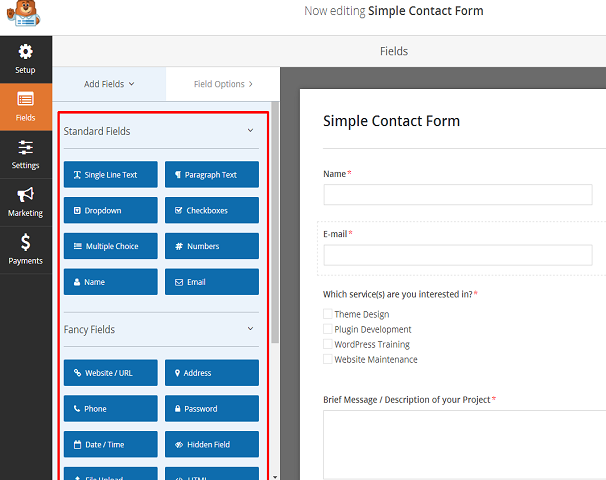 Not only does this plugin make adding a contact form to your site very easy, but the intuitive drag and drop builder provides a straightforward way to add fields and re-arrange them in any way desired. If you want more features such as Fancy Fields including URL’s, date and time, file uploads, addresses, PayPal integration, conditional logic and much more than you can purchase one of the paid version. In short: For beginners with modest needs, who value ease of use over almost everything else, WPForms is indeed a forms plugin that’s hard to beat! It’s these kind of ideas that we strive for to help us keep improving. Please don’t hesitate to share your thoughts in the future.